Following the experiment modelling the enclosure at East Heslerton where the photographic cover was enough to allow us to map areas beneath trees a more challenging experiment was undertaken with the DJI Phantom 2, GoPro4 HD Black, processed using DXO Pro 10, Agisoft Photoscan Pro and the Sketchfab viewer. A prehistoric Ridge Dyke, probably created to deter stock rustling combining multiple banks and ditches is heavily obscured by undergrowth, beneath which the monument is being badly damaged by burrowing, particularly by rabbits. This 3Di model was created to see how much of the monument could be modelled to reveal the ground beneath the scrub by using multiple quad-copter runs to gather vertical and oblique images. The session had to be stopped as the wind got up but even with a fairly limited number of images a lot of the ground beneath the scrub is modelled. Remarkably at one end of the earthwork where the density of the scrub is lower the modelling process has eliminated most of the scrub which is indicated by dark patches on the surface – shadows of the bushes- and fragments of floating vegetation above. 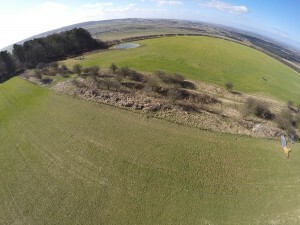 GoPro Image much reduced and un-rectified but showing the bushes growing on banks at the southern end of the earthwork. 3D image (3Di) of potential Promontory Fort on the lower slopes of the Yorkshire Wolds at East Heslerton, in the Vale of Pickering. Imaged using a DJI Phantom 2 Quadcopter, Gopro 4 Hero Black camera, with the images processed using DXO Optics Pro and Agisoft Photoscan Pro. Many thanks to the landowner who made this record possible by clearing the scrub that formerly covered much of this monument.